When doing your research on selecting a new sleeping bag, you’ve got to ask yourself a few questions before you make your decision. In this case selecting the right sleeping bag has a lot to do about your own likes, dislikes, comfort level and how you are going to use it. In this article, we’ll try to give you the theoretical and practical information to form your questions and guide you to make the right selection. As with any personal gear, this is a subjective topic where there are a few things you can consider to aid you in achieving a good result. Right off the bat, our contention is to own more than one sleeping bag to cover warm-weather and cold weather activities. But owning several bags for different purposes isn’t always quite in the budget. Since many of us will be heading out camping and backpacking this summer, we’re going to focus on warm weather options that are available with goose down fillings, and rated for 40-degree temperature levels; as these are a popular choice. Nevertheless, as your understanding of the methods used for sleeping bag insulation and warmth increases, you’ll see how you can apply your understanding of these principles to Fall and Winter activities as well. Most down-filled sleeping bags in this comfort range will compress to about 10-inches in diameter and 15-inches in length when stuffed into a little travel-sack, and weigh a tad more than a pound. That’s perfect for mountaineering and backpacking, but it’s also great for saving space when car camping, horse-pack-trips, cross-country bicycling, dual-sport motorcycling, and trekking via air travel. This particular type of sleeping bag will most likely be priced between $150 and $300 dollars depending on the manufacturer and quality you choose. What’s the value proposition for a down-filled product? Consider this: sleeping bags, parkas, and pants filled with high-grade goose down are insulation products that can become heirlooms, as they are capable of lasting long enough to include in your living will. So whatever you decide to pay for a good sleeping bag, the value is hard to beat. In addition to light-weight, down-filled gear also has a broader comfort range than other types of insulation. Down sleeping bags, as with other down-filled clothing, the loft (or puffiness) and the air that is trapped between the down feathers and the baffles (compartments) are what provides insulation and warmth in concert with your body heat. 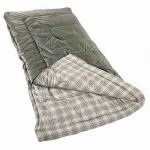 You can consider fleece and synthetic-insulated sleeping bags. Both of which have some great qualities, like softness, warmth, and easy to clean. Synthetic-filled sleeping bags still provide warmth, even when wet. But down has no weight or size penalties. On the other hand, down tends to lose insulation value when wet. It dries quick, but that’s a drag when the sun has no plans for shining bright for three days. Moisture can come from wet snow, rain, condensation inside a tent, sweat, or sleeping outside in dense overnight fog. So there are several factors to consider in selecting how you are going to stay comfortable sleeping under the stars, and staying warm on your adventures. Do you intend to spend your trip in, an alpine or desert climate? Consider the climate conditions of the areas you want to explore. You can get a good sense of your target playground by asking questions, drawing from personal knowledge, or online research. The U.S. Forest Service, National Park Service, and Bureau of Land Management websites may prove valuable in getting good information. Even if this will be your first year planning an outdoor lifestyle use the internet, to find resources to understand the climate zone you intend to frequent. As an example, on the Appalachian Trail in the Southeast U.S., elevation induced temperatures may not be a huge factor, but nights can get chilly and damp. Out on the West Coast the Sierra Nevada Mountains, high and low deserts, the coastal ranges, and the Cascade Mountains, along with several other mountain ranges can vary in temperatues during the season. Each mountain region, where ever it may be, has its own weather system that needs to be investigated. Shoot to build yourself a summary of your chosen geographic region where you plan on spending a few nights outside. There’s a bit of truth in the “quick-witted” remark of: “It’s not what you have. It’s how you use it.” Will you be packing that sleeping bag on your back, or strapping it to a donkey? Do you plan on lashing it to a Mt. Bike or a BMW dual-sport? Car camping? It’s possible you may be planning for all of the above scenarios but if weight is a factor then add that to your selection criteria. Sleeping bags also come in various weights and sizes. You don’t want a large-heavy bag stuffed in your backpack. But for car camping, it may be a non issue. Will you be using a two or three-person tent? Having a good, light-weight yet weather-stout tent will, in most cases, keep you out of inclement weather and increase the warmth producing ability of your sleeping bag. If you plan of using just a drop-cloth, a sleeping pad, and a mosquito net, choose accordingly. Likewise if you plan on constructing a light-weight lean-to, a wind-break made of flat rocks, or holing up in a compelling snow cave you dug for the night, you may want to select a bag intended for cooler temperatures. Temperature ratings are really a generalization that depends on many variables only you can asses. Some manufacturers use in-house methods to rate the insulation value and comfort level of their products using criteria such as product construction, amount and quality of down fill, and field testing. Other manufacturers use the consistant third-party standard known as the European Norm (EN) rating system to indicate the temperature rating of a sleeping bag. An EN rating, for example EN13537 indicates the particular type of sleeping bag — most down bags are constructed as mummy-shape or semi-mummy — is scientifically tested in a climate chamber using a “dummy in a mummy” sleeping bag. Always check the comfort ratings of sleeping bags. If you’re not sure ask the sales person for help. Assumptions such as use of a tent and a base-layer of clothing, using socks and head covering, are made. Additional asumptions are the size, weight, and position of the dummy’s as laying on their back, are made. Additional criteria such as a person’s experience in taking full-advantage of the insulation qualities of a given sleeping bag, such as curling up into a cinnamon bun, or wearing even more than base-insulation clothing. Also factors such as an individuals mental-state are taken into consideration. All the variables are measured, mathematically analysed, and result in a more quantitative estimate of how a specific product (a sleeping bag) will perform in a general setting. And there are a few really knowledgeable and high-quality manufacturers of down sleeping bags and gear that won’t even assign a temperature rating to a sleeping bag. Their take, and it seem to be a rational one, is that you, the individual, should have a good sense of how you are going to use the equipment. You will be the one to know under what controlled conditions ( tent, cabin, cave floor carpeted with woolly mammoth hair) you will choose, or that you will choose the ground…always. It will be you who knows what geographical areas or climates you plan on being prepared for, your physical condition and metabolism, and how you sleep. Manufacturers who take this approach avoid the folly of estimating an application that, in reality, is not in their control. It’s in your control. A down-filled bag that weighs just a pound and several ounces, can only have so much down in it. And the materials and baffle construction will only add so much insulation value, and that value will cost you X amount of dollars for that range of features. It’s still a extremely light-weight and relatively similarly priced device. If you’re still not certain, ask a sales person for help. 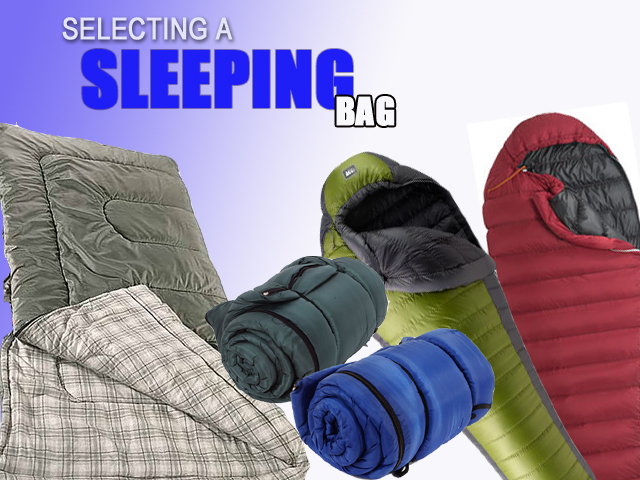 Most of them are very knowledgeable about helping you select the right sleeping bag for your particular use. At the top, the highest quality down is considered to be European goose down. Canada is also a source for down. Fill-power is measured as cubic inches per ounce of down. A power of 700, for example, means the lofting capacity is outstanding. Lofting capacity is the ability of literally a couple million down filaments to trap still air and provide superior insulation with the least amount of physical weight. Grades of down are measured by slipping an ounce of the wispy, prepared, filaments into a glass tube in a temperature controlled environment, compressing it, and measuring that compression. High-quality down will compress more and weigh less than a sample of lower-grade down required to attain the same warmth. Size matters. Larger, traditional style bags are great if weight isn’t an issue. All down is simply three-dimensional clusters of fluffy feather material that grows from a feather shaft to provide winter warmth for the bird as a layer close to the skin. Down is found only in waterfowl such as geese and ducks; both the primary source of textile-use down. Premium down is gathered by hand from mature European geese after they have molted (shed their winter base-layer) in the Spring. These ultra high-end geese flocks are relatively small, and the primary purpose of these birds are for breeding. Therefore the down is a relatively rare insulation material, not easy to come by, and not cheap. Lesser quality down material may come from young geese only a few months old. Down from young geese is also a secondary product, but is collected in the harvesting cycle (early demise), as the youngsters are converted into pate’ to be spread on crackers with a dollop of caviar at the bequest of the Queen! A down-fill value of 500 to 500 is good for very cold conditions, but the down sleeping bag (or parka) will require more down fill to generate appropriate insulation qualities and warmth. Weight will increase by the same ratio as the item will require more down to generate more warmth capability. So if you’re not obsessed with counting calories, you might not be spun out by additional ounces of weight, and this level of down insulation may fit your application just fine. Now, any grade of down-filled product in the 400 to 450 range of down-fill is still a viable option if it suits your application and budget. Howbeit, this grade of down is most often relegated to street fashion. A jacket (or sleeping bag) will still provide good warmth with an increase in weight. Hyper puffed parkas of this ilk can be observed on the upper torsos of the good folks of New York City. Yep, most any icy winter night they’ll be commuting on foot between the cubicle, the pub crawl, and back to the loft; warm and trendy. But keep in mind, and this may be a factor in price, high-fill power down ranked between 600 and 700+/- is also excellent in light weight and high insulation quality. It too will be used in expedition-grade products. It’s also a scarce material resource to gather, process, and select. For most of us, this is the sweet spot for selecting a great sleeping bag…or parka. Gear that uses 800 and above power-fill down is the best you can obain. It’s the benchmark for light yet warm insulation. As you shop, this is a number to look for and means more than an estimated comfort range. Expedition gear and extremely high-altitude down clothing and sleeping gear will source 800 power-fill down in many cases. It’s also a more scarce material to gather, process, and select long before it is available to the market. Hi, Congratulations to the site owner for this marvelous work you’ve done on the site. We’re newbies at this and are planning on our first weekend camping trip. This info will be very helpful. We’ll check the site regularly for more tips. Great article. Thanks for the info. Thank you. I am plased to say that I just purchased a pair of 40-degree sleeping bags for our summer camping trips. I wanted to find out if a liner would be a good investment too? Liners make a great investment, especially if most of your camping will be done in the summer. The liners allow you to use your sleeping bag as more of a cover and you can avoid zipping and unzipping the bag as you get hot or cold. Liners also keep your sleeping bag cleaner as washing a bag starts to break it down and it’s much easier to launder the liner than the sleeping bag. Excellent Blog. It goes without saying that there are different sleeping bag and tents for different usages. I think one should specifically decide what purpose or for what climate one is going for before investing on there great outdoor gear. You might consider going to REI and/or independent mountaineering stores and look at the known high-quality brands with synthetic insulation. Look at Kelty, Sierra Design, Mt. Hardware, Marmot, etc. and put hands on them, ask questions of the store people, consider the upsides/downsides to each, and choose a bag you think will work. That’s kinda what we do when we seek a product to review. We try to get the best product for the application as if we were going to buy it. Regardless of what specific synthetic insulation a sleeping bag has, it will have a temperature or comfort range you’ll want to match to your kind of use. Look for light weight, compactness, roominess, and most of all…choose one you like. It’s okay if that first sleeping bag doesn’t measure up as your experience will point you to one that does suit you, and one that you are happy with. The take away is that all synthetic insulation will do the job of keeping you warm in their given comfort range. Find one you like and that works for you; one that packs well and has a sturdy two-way zipper. Please don’t look for a sleeping bag at Wal Mart or a box store. A little in-person research, a little information gathering, and make your decision.